Joseph Johansson | Why does Rolling Resistance matter in the real world? Rolling Resistance is the term used for the energy required to roll a tire over a particular road surface. It can be viewed as a Parasitic Power Loss, accounting some 13% of the total energy required to move a long haul tractor-trailer combination over a smooth road at 65 mph. 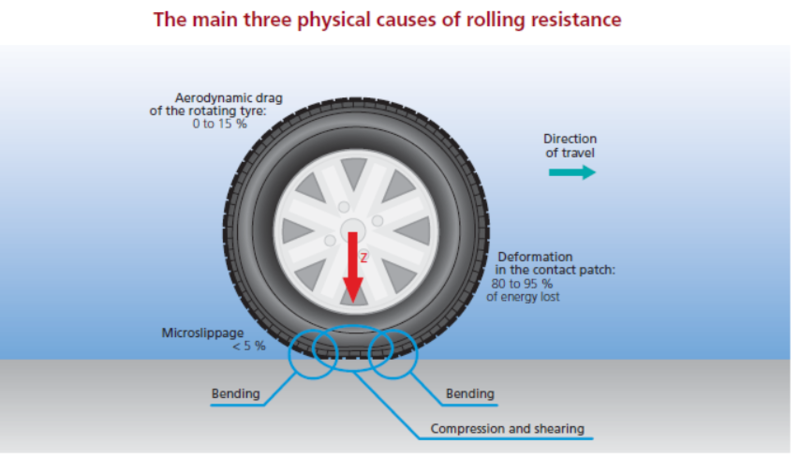 Rolling Resistance is also greatly impacted by condition of the road surface. Because it is energy LOST, it is equivalent to a power loss. Power made by the engine is not fully usable, and inhibits forward movement of the vehicle. Fuel consumption is therefore increased because of this parasitic loss. 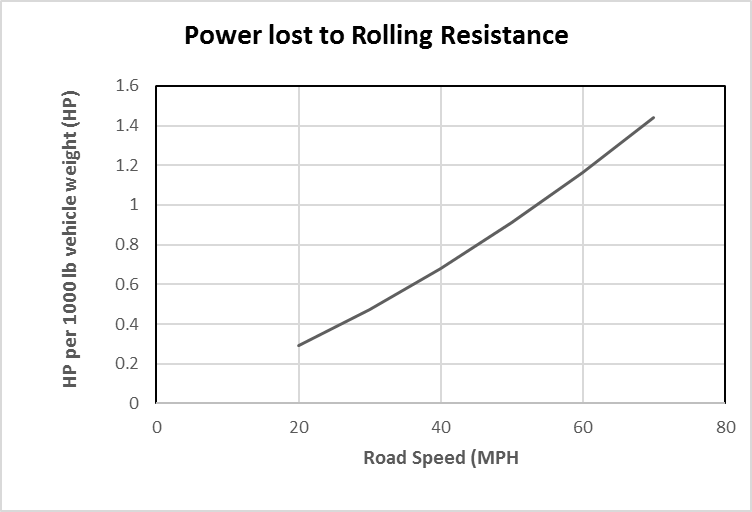 How can you reduce Rolling Resistance? Keep tires properly inflated. Properly inflated tires minimize deformation of the contact patch and side walls, and keeps energy loss to a minimum. Use “green tires”, with rubber compounds and treads designed to minimize this energy loss. As much as 35 HP may be “saved” at 65 mph at 80,000 lb. Use of single wide-base tires in place of dual assembly tires. Two dual tires have four sidewalls as opposed to two for a single tire, thus reducing the side wall flex and energy loss. Larger diameter tires have slightly lower energy loss due to the fact that there is less bending of the tire as it enters and leaves the contact patch. The standard baseline basic tire is the bias ply type, which is given a Rolling Resistance factor of 1 running on smooth concrete. This is given as a resistance of 10 lb per 1000 lbs gross vehicle weight, which is equivalent to 1% grade. Most tires used today are radial tires, which have 25% – 30% less rolling resistance. This means a factor of 0.70 – 0.75. The most recent design low-rolling resistance tires have factors in the range of 0.5 to 0.6 depending on the specific design and application. Note that at higher speed, the aerodynamic forces begin to overtake Rolling Resistance as the major contributor of power loss. 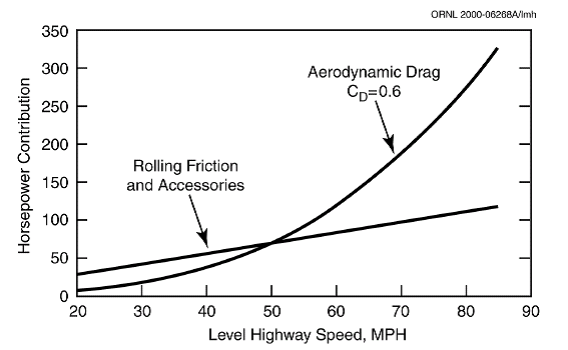 HP required to overcome drag and rolling resistance/accessories relative to top speed for a typical Class 8 truck trailer combination. U.S. Dept. of Energy 2000 “Technology Roadmap for the 21st Century Truck Program, a government-industry research partnership” Technical Report 21CT—001 December. These factors can also be expressed as HP. 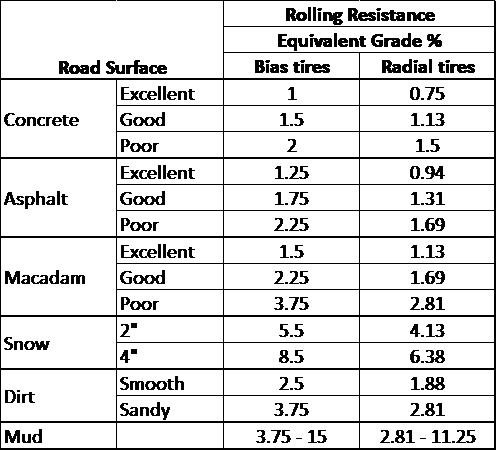 A bias ply tire on a smooth concrete surface has a factor of 1.0, and a radial tire 0.7 to 0.75. These “multipliers” must be used to adjust the rolling resistance power loss to the specific road surface.